President Obama emphasized the importance of U.S.-European relations in Brussels today amid the allies’ growing concerns about Russia’s increasingly assertive behavior in Eastern Europe — and at a time when most Americans see political, economic and military ties with the continent as more important than they did several years ago. Half of Americans saw ties with Europe as the most important internationally for the U.S. compared with 35% who said relations with Asian nations are the most important, according to a Pew Research Center survey conducted last fall. 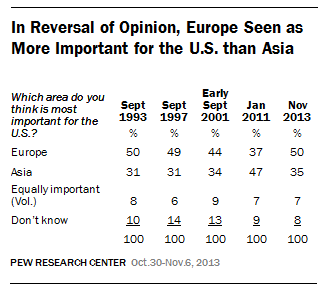 That represented a change from 2011 when Americans viewed ties with Asia as more important than those with Europe by a 47% to 37% margin. Republicans (58%) were more likely than Democrats (48%) or independents (45%) to put more importance on the relationship with Europe, but all three partisan groups tilted more to Europe in the 2013 poll than they did two years earlier. Breaking ranks with this view are young adults: They see ties with Asia as more important by a 52% to 37% margin, about the same proportions as in 2011. But older Americans have gravitated back to the view that Europe is more important to the U.S. than Asia, especially those 65 and older, among whom 60% put the priority on Europe.